What the heck are Plyo Moves? In the fitness world, Plyos are cool lingo for Plyometrics. Plyos, also known as jump training, are exercises in which muscles exert maximum force in short intervals of time, with the goal of increasing power. 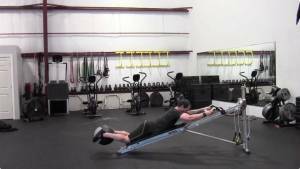 This training focuses on learning to move from a muscle extension to a contraction in a rapid or "explosive" manner, such as in specialized repeated jumping. OK, now that we have a fancy definition, why the heck would you want to do Plyos? So, read on as I’ll give you 5 great benefits of doing plyometrics as well as 3 awesome reasons they are even best done on your Total Gym. Then I’ll give a list of 10 of my favorite Plyo moves. You won’t want to miss seeing these so ensure you watch the accompanying video and you’ll be ready to “get your Jump ON!”. There is a reason for the phrase “Jumping for Joy”. I have yet to hear the phrase “jumping for sadness”. When is the last time you actually jumped and caught air? Unless you play a specific sport that requires jumping, I would guess it may have been years since you've defied gravity and leapt from the earth. I have taught hundreds of group classes on the Total Gym equipment and guess what happens every time I would do Plyo Moves in my class? Smiles! Lots of smiles. Hey, it feels good to jump and many of these students hadn't jumped since they were kids hence the big old grin on their face. Cross Training at its Finest. My favorite saying is "to keep your muscles progressing you have to keep them guessing”. Explosive Plyo jumping will tax more of your fast-twitch muscle fibers and work your muscles in a different manner. By cross training and mixing up your workouts you will get better results and avoid those dreaded plateaus, physically and mentally! This alleviates boredom and keeps your workouts fresh. Heart Health and Calorie Torching. Plyo Moves require a lot of energy and thus increased blood flow to the biggest muscles in your body. This makes your heart rate jump as well strengthening your heart muscle. This comes in dandy-handy if you want to live longer! These safe, high impact moves actually stress your tendons, ligaments, and bones in a good way that ultimately strengthens them. I have several clients in their 80s and we do plyometrics religiously and they love it. My favorite client, Betty, turns 90 this June and she loves what she calls “Jumpy Jump Time”. Did I mention they are FUN! If you enjoy sports like tennis, flag football, pick-up basketball games, etc. then adding plyometrics to your fitness routine Will only improve your performance during these fun, calorie burning activities. Your spine is fully supported by the glide board so your body remains in a perfect, ergonomic, safe position so you are less likely to get injured. There is less impact on your joints. If you're like me and you've put on a few extra pounds since your high school days, regular old jumping from the floor could be detrimental to your knees, hips and lower back. Even doing Plyo Moves at the highest level on your Total Gym, you are only using about 60% of your weight which you can control and lessen just by lowering the level of your Total Gym. You have a unique ability to actually control your range of motion. This is hard to explain so you'll just have to watch the video to see what I mean but it is perfect for any one with current or past knee issues. Check out my follow up blog next month where I’ll show you how to incorporate your upper body into your Leg Plyo Moves. I’ll also demo some cool Plyo Moves you can do for your upper body so your legs aren’t the only ones having FUN!